Oh my lovely Tim Burton. I used to be that girl, spending late nights watching your movies, adorned in all black from hair to toe polish, clutching a copy of Neverwhere tightly to my young breast. I worshiped you because only you could capture the creativity and soul of my goth heart and make it real, special, seeing something beautiful and haunting in a way that captured the masses without pandering to them. But unfortunately, you finally looked down the rabbit hole and pulled out a mess that despite all the beauty and haunting imagery, feels as superficial as the twelve-year-olds I see running around the Manga section of Borders in chains and pink punk skirts. And in my old age, it feels like the ultimate betrayal of what lies left of my dark teenage soul. Your Alice is hardly Alice at all, turning the upside down logic puzzles of Carroll's books into a Joseph Campbell-esque plot that disappointingly falls flat on its face. 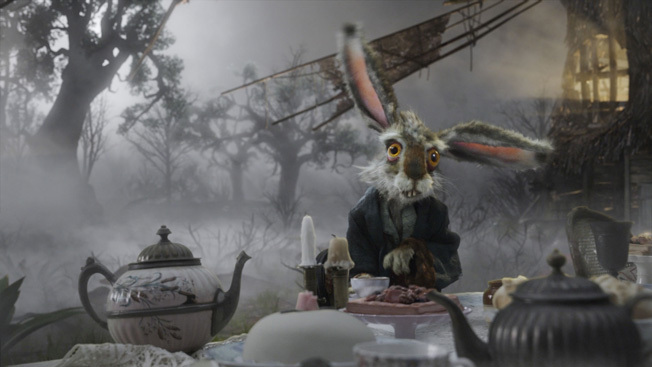 If you had chosen to fully embrace the crazy nonsense of Wonderland, this might have been a truly innovative, freakout of movie as classic as the animated Disney original. But you decided not to focus on the intriguing parts of Carroll that make it the classic that it is, but stripped it bare. 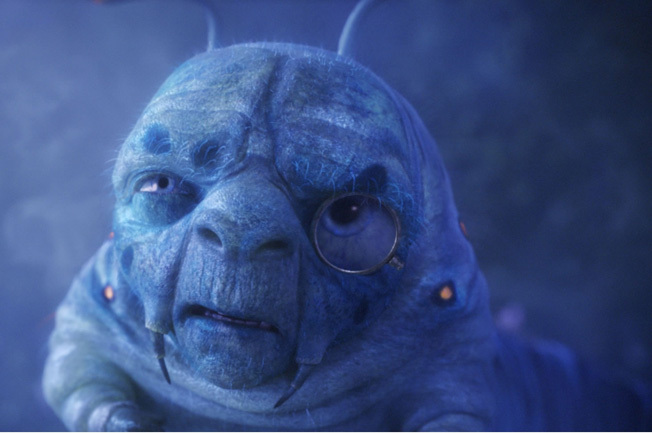 Perhaps assuming we're already familiar with the cast of characters, you sped through their introductions to get to the action, leaving us to just briefly revel in the ideal casting of Alan Rickman as the smoking caterpillar before jaunting Alice off for another broken, unsatisfying glimpse at the tea party scene, and then off again, and again, and again. But all this action leads nowhere. You strangely introduced a straightforward plot that concludes in a large battle but produced no tension. There is never any question that Alice isn't going to win, and even then you seem not to care whether or not anything happens. And it doesn't. Nothing happens. Ever. You try to tell us that the Red Queen is bad, she cuts off heads! for goodness sake! 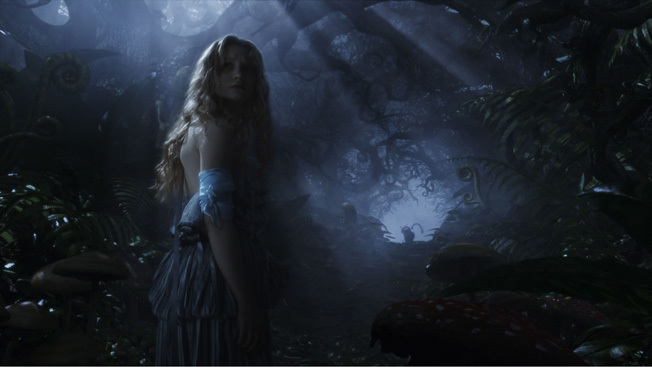 But produce only an insincere, half-assed flashback of her "jabberwocky" turning the Mad Hatter's village to cinders. If you're going to pull this move to get us to care, at least give us a chance to connect to a wife and screaming children in the flames, or maybe a whimpering puppy at least. But the sad look on the Hatter's face is the only indication that clearly this was a bad thing, and that it caused his madness. His madness, is as equally half-assed as his flashback, his sanity surfacing at all the convenient times in the most cliched ways to move the journey forward. Alice doesn't even really have to fight; it's the sword that knows what to do and how to do it. By the end, everything seems forced, and the actors especially, seem to notice too. You could have at least made it exciting ala Percy Jackson and the Olympians (incredibly predictable yet totally fun), but no, nothing happens. Nothing. You are lucky Tim, as there are a few good things here. Johnny Depp's Mad Hatter is nearly perfect, despite going from dandy absurdity and ending up as a Scottish hero, and Mia Wasikowska is very pretty to look at and generally does a good job of insisting that yes, she is Alice, but no, not the one that everyone's going on about. They seem to have a real connection that is a strong point in the film, that is, when it's not confusing and bandying about between the romantic and the parental. I dug your empowering message about being yourself and nearly cheered when Alice took to battle in a full suit of armor, hair flowing, instead of a wimpy dress. 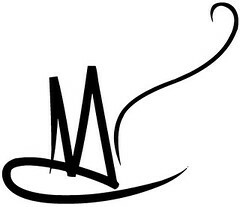 Sure, your images are stunning, some of your best yet perhaps, particularly at the tea party, in the moat of heads circling the Red Queen's castle, or at the end when we re-encounter our caterpillar friend after his transformation. But many of these images are also your worst. While you have your trademarks that have stuck around for good reason, here you recycle too many of them. Mixed with the same day-glo color scheme of Charlie and the Chocolate Factory, they feel old and worn out, especially in a film whose subject matter is an open visual book waiting to be painted. Everything about your White Queen is off, from the horrible CGI, to her dark contrasting lipstick, and drugged fairy attitude, none of which is Anne Hathaway's fault, as it's clear she's trying to do something, but like Depp wasn't allowed to let loose. I know that Disney probably gave you a giant budget, but you'd certainly never know it as your CGIed backgrounds are often shoddy, especially noticeable when you work with your favorite time of day (gloomy twilight). 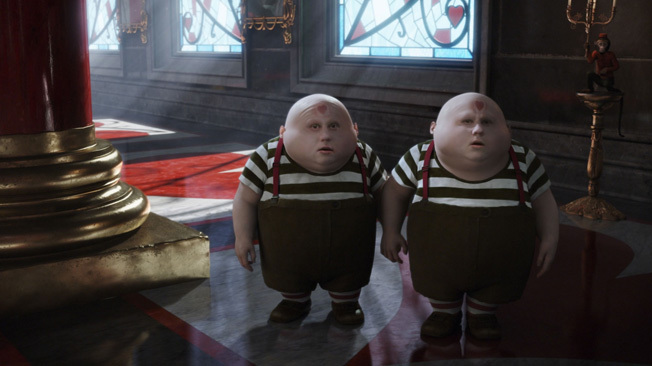 When Tweedle Dee and Tweedle Dum show up they are so obviously fake it's like revisiting the early CGI years of the first Harry Potter. Alice has exposed you Tim Burton. You can no longer hide underneath your imagery as you have in many of your so-so films that also get bogged down in your inability to manage the tension, pacing, and flow of the story. You have to act like a director and manage your vision and your plot. Because it's true; when someone like you sells out, it's pretty damn awful, Avril Lavinge song at the closing credits and all. Stick to the Sweeney Todds and the Beetlejuices from now on, and make sure when you do a fairy tale, that you actually take the time to make it one.